New Year’s Eve celebrations are almost here! And it just wouldn’t be the same without a glass of champagne. A flute of champs is a classic go-to, but this year, why not switch things up by sipping on cocktails that are bubblicious! My Bellini Manhattan combines two of my cocktail favorites. Just shake up bourbon, peach puree, sweet vermouth, and then top it with a splash of bubbly! And to make it extra swanky, garnish with Gold Cherries – just drain dark cherries and toss with gold luster dust. Ohh-la-la! 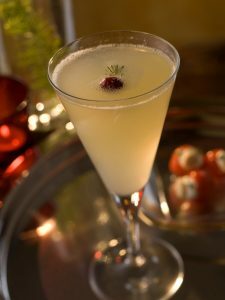 If a lighter spirit is more your style, try my Pear Thyme Sparkle– it’s a deliciously delicate holiday sip. Pear vodka, lemon elixir and fresh thyme, shaken ‘til icy cold, then strained into a martini glass – and of course topped with a splash of bubbly! The fresh thyme adds a lovely dry note to this cocktail and makes for a pretty garnish! But my all-time favorite holiday cocktail is my Douglas Fir Sparkletini. Even the name is festive and fun! Made with Douglas Fir infused Gin, fresh lemon, white cranberry and of course- finished with a splash of bubbly…this zippy cocktail is a total crowd-pleaser. For a more herbaceous flavor, try making the Douglas Fir infusion with half gin, half vodka! And for easy entertaining- you can pre-batch your Sparkletini by converting the ounce measurements to cups and storing in a sealed bottle. When you’re ready to enjoy, simply pour 3 ounces into a shaker tin, shake with ice, and strain into your favorite glass. Don’t forget the bubbly finish! So break out the fizz and get ready to celebrate! Cheers to New Year! This is absolutely my favorite holiday cocktail. The light essence of Douglas fir infusing the gin evokes a sleigh ride in the woods, and the pouf of Champagne adds a festive effervescence. Fill a cocktail shaker with ice. Measure in the infused gin, cranberry juice, and lemon sour. Cap and shake vigorously. Strain into a martini glass and top with a splash of Champagne. Garnish with a fir sprig and float a cranberry in the drink. Put the fir branch into the gin bottle, cap, and let sit 24 hours. (Do not let it infuse for more than 24 hours.) Remove the branch and discard. The infused gin can be stored at room temperature for up to one year. Tips: If fresh Douglas fir is not available in your area, then you can substitute a Douglas-fir tea bag. If using the tea, add the contents of the tea bag to the gin, let infuse, and then strain the gin through a very fine strainer. The infused gin also makes a good martini. In a medium container or pitcher with a lid, combine the ingredients. Cover and keep refrigerated for up to 2 weeks. This is a bar staple and the most commonly used sweetener. Though you can purchase simple syrup, it is ordinarily sweeter than I prefer, so I highly recommend making your own. Proportions vary but it is easy. Mix the water and sugar together in a small saucepan and bring to a boil over medium-high heat. Let boil 1 minute then immediately remove from the heat. Let cool to room temperature before using. Store in a clean glass bottle or container, at room temperature, for up to 2 weeks or, refrigerated, for up to 3 months. Non-stop holiday parties and overindulging have you feeling a little sluggish? 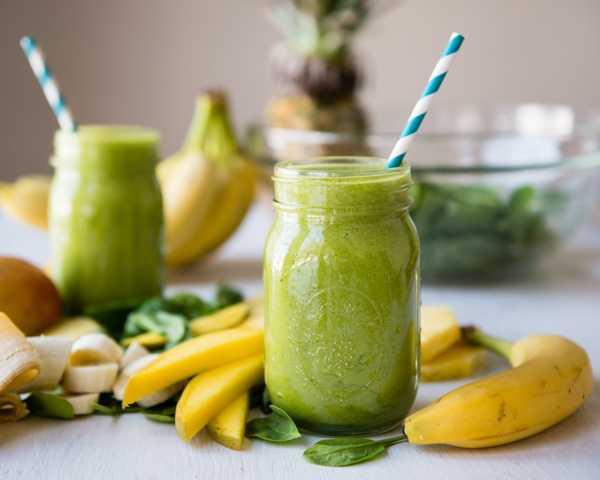 Recharge with Green Smoothies! They are the perfect way to detox your body and ramp up your energy. Store-bought juices and smoothies might taste d’lish…but they can be super high in calories and sugar, which kind of defeats the purpose. Try my favorite homemade Green Smoothie instead! Tear up 2 large leaves of organic Kale and toss in a blender. Then add 1/2 a banana and a tiny touch of honey or maple syrup, and some unsweetened coconut or almond milk. Add in a scoop of ice and blend it up until totally smooth and brilliant green! Looking for something a little creamier? Try my Jump Start Smoothie! You can also jazz up your smoothie with matcha powder, flax seeds, goji berries, or even almond butter for an added energy and protein boost. Try it as a meal replacement for a few days and you’ll be recharged in no time at all. When you start to see eggnog everywhere, you know the holidays are here! Velvety smooth and rich with warm spices. YUM! Great served warm or cold over ice – and even better with a splash of rum, whisky, or brandy! It always adds some holiday cheer to any gathering. These days you can even find non-dairy and vegan options to satisfy the whole crowd. But guess what! There are lots of other ways to enjoy eggnog other than drinking it. Let’s try it in some desserts! Like in my recipe for a light and fluffy Eggnog Chiffon Pie – OR if bread pudding is more your style, try substituting eggnog for the cream. So d’lish drizzled with a spiked caramel sauce. You can even top your favorite holiday pie with eggnog ice cream! Pre-bake the Spiced Crust and cool. To make the Eggnog Filling: In a small bowl soften gelatin in the water for 5 minutes. In a medium bowl whisk together the 4 egg yolks and 1/2 cup of the sugar (reserve the egg whites and remaining 1/2 cup sugar), and set aside. Place half & half in a heavy-bottomed large bowl set over a pan of simmering water (a bain marie), and whisk in softened gelatin, filling spices and the 1/2 teaspoon rum extract. Heat until hot but not simmering. Whisk half of the hot half & half mixture into the egg mixture to temper the eggs. Add the tempered egg mixture into the remaining hot half & half mixture, whisking constantly. Cook slowly until the mixture becomes thickened, stirring all the while. This should take about 3 minutes. When mixture is thickened, remove from heat and cool to room temperature, stirring often to release the heat. When mixture is cooled, place the egg whites in a mixer bowl and whip on high until soft peaks form, then gradually add the reserved 1/2 cup of sugar and whip until stiff peaks form. Fold 1/4 of the whipped egg whites into the cooled mixture to lighten it. Then gently fold in the remaining whipped egg whites until combined. Mound evenly into the cooled, baked pie crust and refrigerate until set, about 1 – 2 hours. 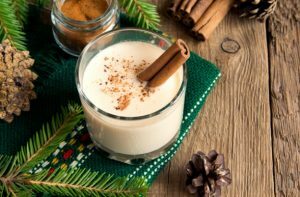 To make the Rum Nutmeg Cream: In a large bowl whip the cream, sugars and nutmeg until soft-peaked, then whisk in the rum and rum extract. Top chilled pie with the cream. * Note: This pie contains uncooked egg whites. Raw eggs are not recommended for pregnant women, children, the elderly or anyone with immune deficiencies. In a medium bowl mix together the flour, sugar, salt, nutmeg, cinnamon, graham cracker crumbs and butter with a pastry blender until mixture looks like peas. Gradually sprinkle in the ice water and mix gently with a fork until dough comes together in a ball. Do not overhandle dough. If dough is too soft to handle, press gently into a disk and refrigerate for about 20 minutes. On a lightly floured surface, roll dough out to a bit bigger than your pan. Brush excess flour off crust, then gently roll up crust onto rolling pin. Unroll into pie pan and press/fit crust into pan. Roll crust over at edges, trimming off any excess dough, then crimp with fingers to make a pretty crust edge. With a fork poke the pie crust all over so crust doesn’t bubble up when baking. Bake for about 8 to 10 minutes or until pastry is golden and cooked through. If you won’t be serving it immediately, the pudding can be cooled, covered, and refrigerated for up to 2 days. Remove 2 hours before reheating. Preheat an oven to 300°F. Heat the bread pudding, uncovered, for 10 to 15 minutes, or until just warm. Place the bread cubes in a large bowl and drizzle with melted butter. Toss in the currants and dried cranberries. In another bowl, whisk together the sugar, egg yolks, whole eggs, eggnog, nutmeg, and rum until well combined. Pour the egg mixture over the bread cubes and stir gently. Let the mixture sit at least 30 minutes, poking the bread down into the egg mixture often and stirring it up every 10 minutes or so. Place the bread pudding mixture in a 7- x 11-inch or 9-inch square glass baking pan. Bake for 40 minutes, or until the center is just barely set and a knife comes out clean. To make the Rum Caramel: In a small bowl, whisk together the caramel sauce and rum. Serve the pudding warm, drizzled with some of the Rum Caramel. Garnish with a pouf of whipped cream. Serve additional Rum Caramel on the side.